The Society is delighted to record the award of British Empire Medal to Gwyneth Margaret Fookes, Honorary Vice-President of the Bourne Society, in recognition of her services to local history and the environment in North East Surrey. 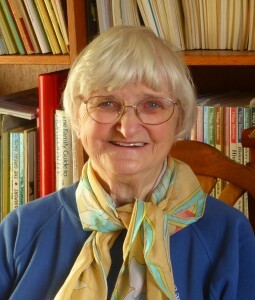 Gwyneth has been instrumental in increasing the membership of the Bourne Society from 500 when she joined in 1970 to a present-day membership of over 2000. She has made an unrivalled contribution to awareness and knowledge of local history, contributing many publications and articles. She has edited and co-edited a vast range of Bourne Society publications, as well as actively canvassing contributions to the society’s journals. Gwyneth has also contributed to local history societies elsewhere, notably Blechingley Local History & Preservation Society, Croydon Natural History & Scientific Society, Denbigh Local History Society, and the journal ‘Brummagen’, covering local history in Birmingham. In June 2008 Gwyneth received a Local History Award – Personal Achievement from British Association for Local History. She has for many years been actively involved with East Surrey Museum, Caterham, including staging a considerable number of exhibitions. In her voluntary work for Surrey Wildlife Trust, and especially in her vocation as a Field Botanist she has contributed enormously to botanical recording, conservation and the natural environment. She is widely consulted on such matters, and received a Green Champion Award from SWT in 2013. She is an active botanical recorder for Surrey Botanical Society and the Botanical Society of the British Isles (BSBI). In her campaigning on Enviromental Issues, Planning Matters (Tandridge District Council and others) and Preservation Issues she has excelled, successfully campaigning against environmental despoliation, preservation of various historic buildings. Largely due to her campaigning and fund-raising the Asprey Fountain in Caterham was removed from its place of obscurity to its present prominent position in Caterham Square. She was the prime-mover in campaigning for, fund-raising, and achieving the restoration of the grave of William Garland Soper (‘The father of modern Caterham’) and has written a book, published by the Bourne Society about him. She has also written the very popular ‘The ‘Big Houses’ of Victorian Caterham’, authoritatively researched and widely regarded, promoting awareness of local history and heritage. Tandridge District Council awarded Gwyneth a Tandridge Citizen’s Award in 2007. In her voluntary work with the Corporation of London, she has been much involved with many issues concerning history and conservation, especially concerning Coulsdon Common, Riddlesdown, Kenley Common and West Wickham Commons. This year Gwyneth was instrumental in originating the removal of St Lawrence’s Hospital, Caterham, WW1 War Memorial from its resting place in Caterham cemetery, its restoration, and its installation in St Mary’s Church, Caterham. In addition, she has recently been the instigator and lead organizer of the Caterham Recruitment Day 1915 Centenary Re-Enactment Parade, organized by the Bourne Society and held on 12 April 2015, raising awareness of the sacrifices made in the First World War, local history, and the importance of remembrance. The re-enactment parade was exceptionally well received, and raised comments such as ‘the finest event in Caterham for fifty years’. In June 2015 Gwyneth was included in the Independent on Sunday’s ‘Happy List 2015’, recognising her contribution as a local historian.